A dental abscess is an infection within the tooth, bone, or tissue supporting a tooth. Causes: Dental abscesses can be a complication of tooth decay, caused by trauma to the tooth, or the result of severe periodontal disease. Symptoms: An abscess can cause mild to severe pain. They often present as a "pimple" on the gum tissue that comes and goes. Other symptoms include a bitter taste in the mouth, bad breath, fever, sensitivity to hot or cold, swollen glands in the neck, or even swollen areas of the upper or lower jaw. Treatment: Once a tooth has developed an abscess, it will require either root canal treatment or extraction. Antibiotics can alleviate symptoms of an abscess, but until the tooth is properly treated, the infection and symptoms will reoccur. What is a Dental Root Canal? 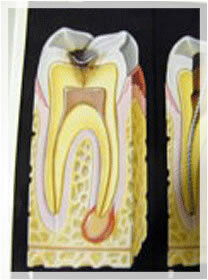 A Root Canal is one of the treatments for a dental abscess. Our goal at Walbridge Dental is to cure the infection, save the tooth, and prevent any complications. Benefit: A benefit of this treatment is that the tooth is maintained in the bone. Maintaining your natural teeth is usually your best option. 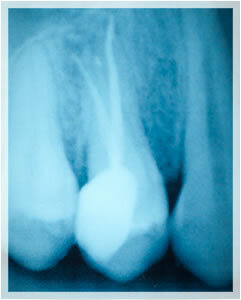 Typically, the alternative treatment to root canal is extraction. Procedure: At Walbridge Dental, we are committed to your comfort. During a root canal procedure, you are numbed, and the infected nerve is removed. We clean and shape the canal with a series of small files, and rinse it with medication to sterilize the canal. We seal your hollowed out tooth with a type of rubber material, called gutta-percha. This rubber material prevents any further bacteria from traveling through the canal and causing further infection. When your root canal is complete, your dentist will typically recommend a crown over the tooth, to protect it from fracture.